Start now and have a cookbook in a week! Create a cookbook in 3 easy steps! Print to your own PC/Mac printer, a local printer like a Kinko's or order professionally printed cookbooks from us! Do you have recipes all over the place? Are your family and friends always asking for your recipes? 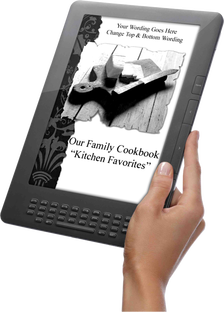 Create your own cookbook and give it away as a gift! 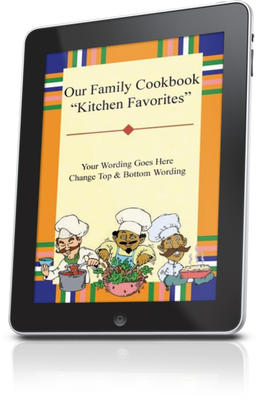 Make your own cookbook with personal stories and photos! 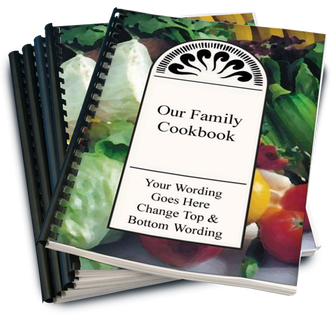 Create your own cookbook and sell it for profit! "Thanks so much for our adoption cookbooks! They look amazing!!! And we are selling them pretty quickly! I wanted to get a quote from you for a reprint. Thanks so much!!" but my girls and I love using the online recipe box. Family Cookbook. Often they ask for a recipe and I send it via online recipe share. I think this is great. Thanks! Can I access recipes anywhere? Yes! 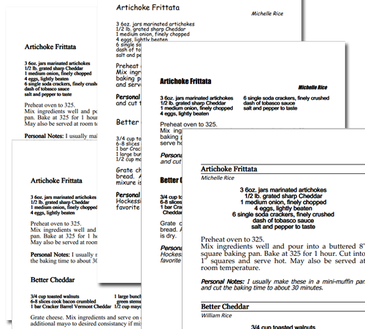 Each recipe can be viewed online with a computer or tablet, used in our iPhone and Android app, emailed and printed individually on your home computer. Can my cookbook be available for sale? No need to make your own - or you can if you want and upload the photo! If you have white space, the software can auto-fill it with graphics or familiar quotes. in the next 12 hours, you will get it for ONLY $29!